Having removed the Certhioidea, Reguloidea, and Bombycilloidea, the main higher level change is the addition of the oxpecker family (Buphagidae). 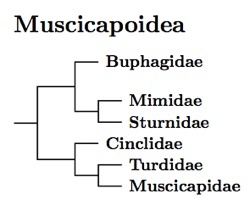 The Muscicapoidea break into two clades. The first contains the oxpeckers, mockingbirds, and starlings (Muscicapoidea I). The other contains the dippers, thrushes, and Old World flycatchers (Muscicapoidea II). The Buphagidae (oxpeckers) must be given their own family to avoid merging the Sturnidae and Mimidae. The Philippine creepers (Rhabdornis) have variously been considered a separate family (Howard and Moore, 2003), part of Certhiidae (Sharpe, 1903; Beecher, 1953), or members of Sylviidae (Sibley and Monroe, 1993), but they actually are embedded within the Sturnidae (Zuccon et al., 2006; Lovette and Rubenstein, 2007). They are basal members of a clade of south Asian and Pacific Starlings, which includes the hill-mynas. The Mimidae seem fairly stable in terms of membership, but have undergone some rearrangement. The taxonomy is based on Lovette et al. (2012). It is little changed from a previous version primarily based on Lovette and Rubenstein (2007), where Arbogast et al. (2006), Hunt et al. (2001), and Zink et al. (1999) were also consulted. There are two main clades, one including the catbirds through tremblers, the other consisting of mockingbirds and thrashers. The genera Mimodes and Nesomimus have been folded into Mimus (see Arbogast et al., 2006; Barber et al., 2004) and Allenia has been split from Margarops (Hunt et al., 2001). The genetics of the Northern and Tropical Mockingbirds are complex, and the complex deserves further study to sort out the situation. The Galapagos complex also deserves further study. Arbogast et al. (2006) found that the Genovesan race of Galapagos Mockingbird (bauri) appeared to be more closely related to the San Cristobal Mockingbird than to the other races of Galapagos Mockingbird. The Phillipine creepers (Rhabdornis) were thought to be babblers, but Barker et al. (2004) and Cibois and Cracraft (2004) found they were allied to the starlings. This led to thoughts they should be a separate family, but more recently Zuccon et al. (2006) and Lovette and Rubenstein (2007) found they were embedded in the Sturnidae. The taxonomy here mainly follows the extensive analysis of Lovette and Rubenstein (2007), with help from Lovette et al. (2008) and Zuccon et al. 2006. Lovette and Rubenstein identified a number of major clades. The subfamily Graculinae includes the starlings and mynas of south Asia and the Pacific. It includes two tribes, the Phillipine creepers (Rhabdornithini) and the south Asian/Pacific starlings and mynas (Graculini). The second subfamily, Sturninae, includes the Eurasian and African starlings. It includes 4 tribes: the Eurasian starlings and mynas (Sturnini), the Amethyst and Madagascan starlings (Cinnyricinclini), the red-winged starlings (Onychognathini), and the African starlings (Lamprotornini). Lovette et al. (2008) provides a complete genetic analysis of all of the extant Eurasian starlings and mynas (Sturnini). The genus Sturnus was found to be overly broad, resulting in splits of Pastor, Gracupica, Agropsar, Sturnornis, Sturnia (aka Temenuchus), and Spodiopsar (Poliopsar). Also, S. burmannicus has been moved to Acridotheres. The recent paper by Zuccon et al. (2008) slightly refines the ordering (mainly the Hoopoe Starling), and corrects two of the genus names (to Sturnia and Spodiopsar). The extinct Reunion Starling has not been sequenced, but is believed to be sister to the Hoopoe Starling. Other generic changes include splitting Hartlaubius from Saroglossa, and both Notopholia and Hylopsar from Lamprotornis. In the other direction, Spreo has been merged into Lamprotornis. Finally, Poeoptera femoralis has moved from Cinnyricinclus.